2 Shows, One Huge Night! The Guns N’ Roses show. A brand new authentic tribute to “the most dangerous band in the world”. GN’R are undeniably one of the biggest rock bands of all time. Their first LP ‘Appetite For Destruction’ became the highest selling debut album of all time, and continues to sell to this day, with new generations of youngsters idolizing the iconic rock gods. In 1993 Guns N’ Roses played the largest ever headline show in the southern hemisphere, at Melbourne’s Calder Park, which the band still talk about when recounting career highlights. 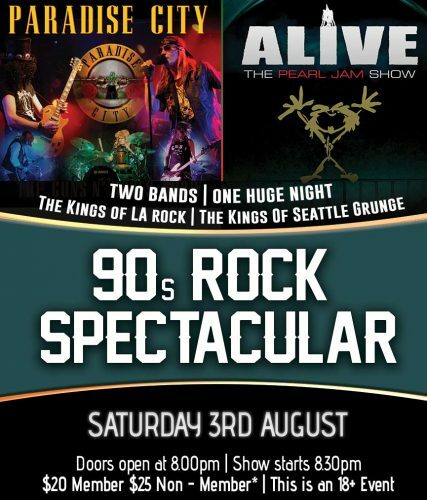 Also Presenting “ALIVE” the Australian Tribute to one of the most iconic bands in rock history – PEARL JAM! Eddie Vedder’s rich baritone growl is brought to life by vocalist Mark Hennessy and his commanding stage presence truly re-creates the epic experience that is Pearl Jam live. From the unforgettable melodies of “Betterman”, “Daughter” and “Last Kiss” to the angst ridden grind of “Alive” and “Jeremy” and the unbridled aggressive crunch of “Even Flow” and “Animal”, this 2 hour show is packed end to end with unforgettable sing-a-longs and classic guitar rock anthems. “Alive” The Pearl Jam Show is truly a world class tribute to one of America’s finest rock & roll bands. Error: Error validating access token: Session has expired on Saturday, 02-Feb-19 17:58:11 PST. The current time is Saturday, 20-Apr-19 03:12:29 PDT.